The Bank of Nova Scotia issued currency from 1832 until 1935. The bank itself is still open and is a highly regarded international financial institution. The bank was originally built around shipping and lumber trade. Its first branch bank opened in 1837 in Windsor. Branches in Pictou, Annapolis, Liverpool, and Yarmouth were opened by 1839. The railroads opened significant expansion possibilities. The Bank of Nova Scotia even had locations in Chicago, Minneapolis, and Boston before 1900. The bank had several international locations by 1920. Lots has been written about the history of the bank, but we are focused on bank notes here. The Bank of Nova Scotia issued dozens of different types of currency. Our guide below has lots of price and value information. However, we strongly recommend that you contact us if you have paper money for sale. We give free appraisals and would be happy to help you value your bank note. As is the case with most early banks in Canada, currency from the early days of The Bank of Nova Scotia is rare but not very attractive. These could be dated as follows: Aug. 6 1832, 2nd June 1834, 3rd April 1837, or 1 Jany 1839. Some of these were issued in very strange denominations because of legislation that required a minimum denomination of 26 shillings. So the bank printed notes for one pound ten shillings, two pounds, two pounds ten shillings, five pounds, and ten pounds. Rawdon, Wright, Hatch & Co. New York handled the early bank note printing duties. The New England Bank Note Co. Boston printed currency for The Bank of Nova Scotia in 1840. Denominations were five pounds five shillings, six pounds, seven pounds, and seven pounds ten shillings. All of these bank notes are very rare today. Some currency from The Bank of Nova Scotia has an engraved date of January 1st 1852. See “Bank Notes from 1832 – 1839” above for more information about 1852 bank notes. They are one in the same. The Bank of Nova Scotia printed some twenty dollar bills in 1864. This marks the first time the bank issued money denominated in dollars. These should be dated as 1st January 1864. Printing duties were handled by Blades, East & Blades, London. We are specifically talking about four, five, and twenty dollar bills here (look further down the guide for 1877 $10 bills). These are grouped together because the denominations had similar designs across this eight year period. The engraved issue dates are July 1st 1870, July 1st 1871 and July 2nd 1877 which were all used for the four and five dollar denominations. Twenty dollar bills were limited to the Jan. 1 1877 issue date. There are varieties based on whether or not the bank note has a red “Canada Currency” overprint. These are collectible, but they are rare. They could be signed by Jairus Hart, Adam Burns, or John Doull. The American Bank No Co. N.Y. did the printing. There are several varieties based on the color of the back and front of each bill. Research shows that 420,000 of these bank notes were printed across all varieties. Contact us for exact pricing information. These come in seven different varieties based on the year, overprint, and signature. A couple of the early 1898 varieties are very rare. The other types are scarce, but not prohibitively so. The exact printing dates are June 1st 1898 and September 1st 1908. Contact us for exact pricing details. The Bank of Nova Scotia printed more than three million five dollar bills dated as July 2nd 1918. These feature a portrait of John Y. Payzant and H.A. Richardson. They are signed by Charles Archibald and H.A. Richardson. The American Bank Note Co. Ottawa handled the printing duties. Please contact us for exact values. Five dollar bills from January 2nd 1924 have a portrait of G.S. Campbell and John A. McLeod, both of whom signed these bank notes. These aren’t especially rare, but that can be worth decent money if they are in perfect condition. Contact us for value information. The Bank of Nova Scotia printed approximately 3.2 million of these five dollar bills. Each note has a portrait of S.J. Moore and John A. McLeod. Both Moore and McLeod signed these bank notes. January 2nd 1929 is the issue date. Most bank notes are worth around a few hundred dollars. Perfect specimens can be worth more and notes with condition issues will be worth less money. These are the most common and least valuable five dollar bills printed by The Bank of Nova Scotia. John A. McLeod and Henry F. Patterson are shown on each bank note. They also signed each note. Please contact us if you need a free appraisal. The Bank of Nova Scotia issued ten dollar bills dated July 2nd 1877. There are three varieties based on who signed the note (Payzant, Hart, or Doull). These are all very rare. We have included an image of a proof note below. Ten dollar bills from 1903 are dated as January (Jany.) 2nd 1903. These aren’t especially common, but they are also aren’t super rare. Please contact us if you need pricing help. All ten dollar bills issued between 1877 and 1935 by The Bank of Nova Scotia were printed by The American Bank Note Co. N.Y., The American Bank Note Co. Ottawa, or The Canadian Bank Note Company Limited. Most ten dollar bills from 1917 are worth at least $200. Their value increases as their condition gets nicer. Please contact us for details. Choice uncirculated ten dollar bills from Jany 2nd 1919 are few and far between. Circulated examples are fairly common. They should look similar to the note below. The Bank of Nova Scotia printed $10 bills dated as Jany 2nd 1924. These are scarce in high grades but fairly common in low grades. There are two varieties for Jany 2nd 1929 $10 bills printed by The Bank of Nova Scotia. The types are differentiated by the color of their face tints. Each variety is equally common or rare, depending on how you look at it. This is the single most common piece of paper money printed by The Bank of Nova Scotia. Some examples sell for less than $50. Specimens in perfect condition are worth close to $400. The date on these is Jan. 2nd 1935. The design is the same as earlier ten dollar bills. These were printed but we don’t currently have pictures or information about them other than to say that they are dated Jan. 1 1882. These bank notes from The Bank of Nova Scotia are very rare. Their exact date should be July 2nd 1896. 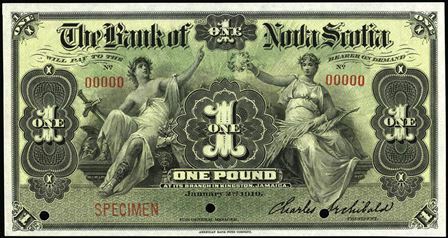 They are signed by John Doull and printed by The American Bank Note Company, New York. Twenty dollar bank notes are also very rare. Their engraved printing date is Novr 1st 1897. It is thought that 1896 and 1897 $20 bills both had print runs of 20,000 (so 40,000 between the two years). That is why they are so scarce today. All twenty dollar bills issued by The Bank of Nova Scotia between 1903 and 1929 have the same design. That is why we only have one $20 bank note shown below. This range covers the issue dates of January 2nd 1903, 1st February 1919, January 2nd 1925, and January 2nd 1929. All of these notes are relatively available in circulated grades. A low price would probably be $400. High grade examples should be worth considerably more. Please contact us for details. We are interested buyers. 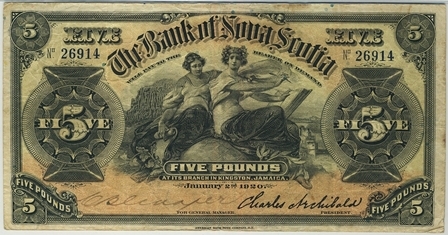 The Bank of Nova Scotia printed fifty dollar bank notes with dates of May 1st 1906, July 2nd 1920, and January 2nd 1925. Surprisingly, the 1925 note is by far the rarest for the denomination. Both 1906 and 1920 examples are difficult to locate in nice condition, with the 1920 date being slightly more common. Once again, please contact us for exact pricing. We are very aggressive buyers of $50 bills. The design for all one hundred dollar bills printed by The Bank of Nova Scotia between 1899 and 1929 is the same. It was issued for five different dates, those being: August 1st 1899, January 3rd 1911, January 2nd 1919, January 2nd 1925, and January 2nd 1929. Notes from 1899 and 1911 are extremely rare. $100 bills from the other years can be located, but they are still scarce. Despite being rare, condition is still very important when attempting to value one of these bank notes. Send us pictures of what you have and we can provide a free appraisal. These are very rare bank notes. Only a couple are known to exist. Bills could be dated as January 2nd 1900 or January 2nd 1919. The signature of Jno Y. Payzant is found on 1900 bank notes and Charles Archibald signed notes from 1919. The signature on the left hand side of the bill varied. Approximately 300,000 one pound bank notes were printed for the 1900 date and 150,000 were printed for 1919. The American Bank Note Company, N.Y. handled the printing responsibilities. Only 10,000 five pounds bank notes were printed for January 2nd 1900. They are very rare today. Five pound notes dated as Jan. 2, 1920 are still rare, but a couple dozen are known to exist. Records indicate 28,000 1920 five pound bank notes were issued. 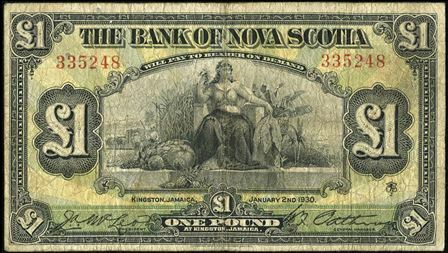 If you want an example of a Bank of Nova Scotia Kingston, Jamaica bank note, then your cheapest option will be a one pound note from 1930. Printing duties were outsourced to The Canadian Bank Note Company Limited. Each note is dated as January 2nd 1930. About 30 of these are known exist. There are two varieties. The first variety is signed by John A. McLeod on the right hand side of the note. The second type is signed by H.F. Patterson on the right hand side of the note. The McLeod signature is slightly more valuable. Records show that 300,000 McLeod signed notes were issued and 250,000 Patterson signed notes were issued. Please contact us if you have any Kingston, Jamaica money for sale. We are certainly interested buyers. We buy all types of Canadian currency. We are especially interested in bank notes from The Bank of Nova Scotia in Halifax. You might be surprised at how much money we can offer for some currency. Send us an email with pictures of the front and back of your bank note and we will respond quickly with our offer. Your piece of currency from The Bank of Nova Scotia in Halifax could look similar to the one seen below. Odds are that you have something different though. We are familiar with all of Nova Scotia bank note issues, even if we don’t have a picture in our guide above. Contact us for more value information or if you have something for sale.